If you’re not familiar with it, farro is a grain similar to pearl barley, but it’s dried in such a way that instead of being fluffy and spongy, it becomes a bit chewy and has an incredible nutty flavor. Farro is a pure form of wheat with the husk intact. It’s been a staple in the Mediterranean diet for centuries, in fact it was a major food for the ancient Romans, who used it to make bread and soups before shifting to wheat. It’s incredibly versatile and pretty healthy too. It contains a lot of fiber which proves to be very good when it comes to digestion and cardiovascular health. It’s also exceptionally high in protein for a grain and supplies more than 10 different vitamins and minerals. It used to be pretty hard to find, but nowadays almost all grocery stores carry it. From Trader Joe’s to Whole Foods to Walmart, look for it in the natural-food or special selection sections. 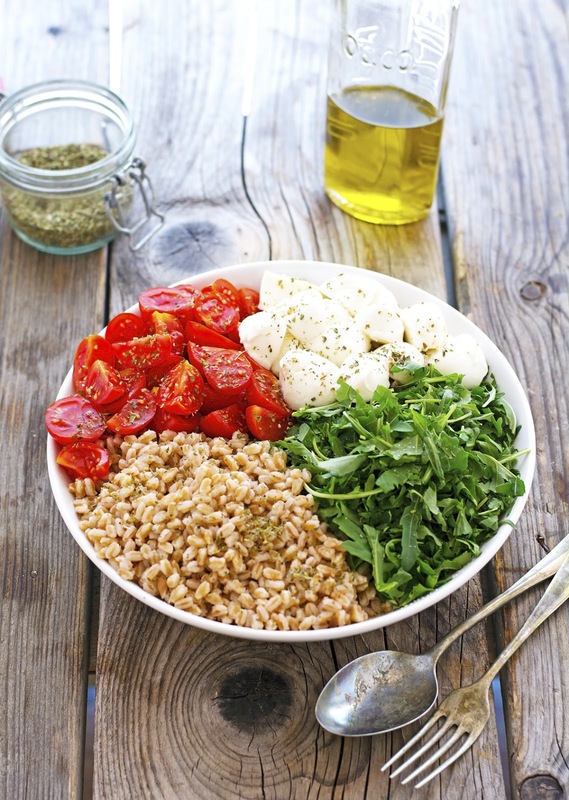 Here’s a recipe for one of my fave salads with farro: Italian Farro Salad. 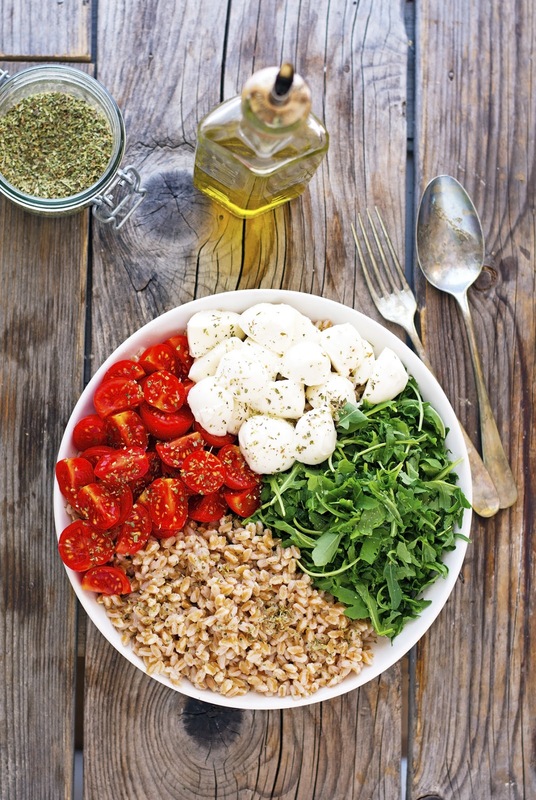 A delicious and versatile recipe to add to your summer rotation: cherry tomatoes, arugula, and mozzarella are tossed with hearty and healthful farro to create a perfect pairing. What I really like about this recipe is that in its simplicity it packs in lots of flavor. It pairs equally with meat or fish, but it’s also substantial enough to stand on its own. I love the soft crunchiness of the the farro as well as its complex, nutty taste. 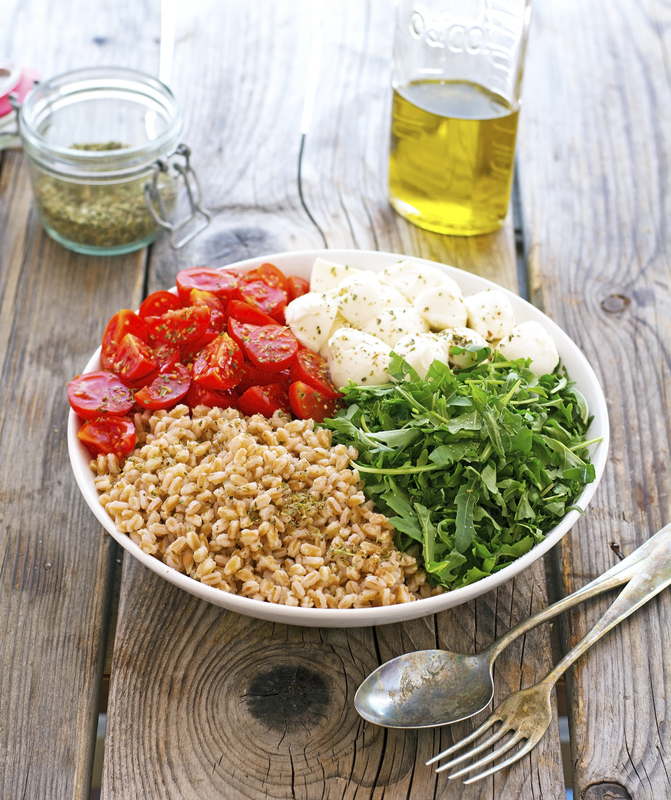 To be honest, arugula is not normally a favorite ingredient of mine but it pairs incredibly well with farro, tomatoes, and mozzarella in this salad. This Italian Farro Salad is quite adaptable to your taste, so don’t be afraid to use up ingredients in your fridge. You can replace mozzarella with crumbled goat cheese or feta. Chopped onions, corn or peppers would also be a nice addition. Do play around. This simple Italian Farro salad is bursting with fresh flavors and it’s perfect for a summer picnic, barbecue or a dinner party. Italian Farro Salad Print this recipe! Rinse and drain farro, then cook according to package instructions. When cooked, drain and run under cold water to stop the cooking. Drain well again and transfer to a large bowl. Roughly chop the arugula and add to the bowl together with the tomatoes and the mozzarella. Drizzle with olive oil, sprinkle with salt, oregano, and ground black pepper, and give a good stir. Take a taste and adjust seasoning as needed. Properly stored, farro salad will last for 3 to 5 days. One serving yields 332 calories, 13 grams of fat, 43 grams of carbs, and 16 grams of protein.